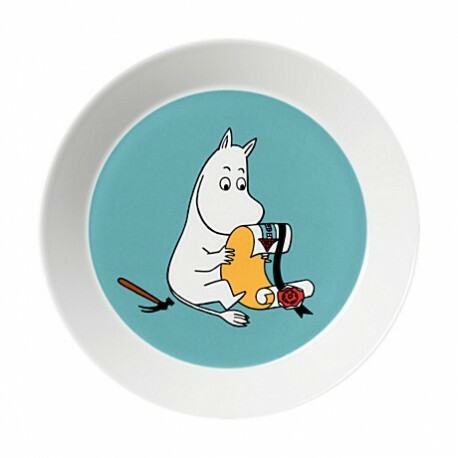 This new turquoise Moomin plate from 2013 features Moomintroll building and looking at house building instructions. It’s skillfully illustrated by Tove Slotte. Moomintroll is the main character of most of the books, a spirited troll with a keen sense of adventure and fun. Moomin lives life fully, and views the world with a feeling of wonderment for such simple pleasures as collecting stones and shells. As gullible as he is enthusiastic, he is also naïve and extremely good-natured. He is in love with Snorkmaiden. In the cartoon strip he finds himself beset by endless problems, and is almost always unhappy, though this is by no means the case in the books.